The hamadryas is larger than the common Anubis baboon and more grayish in color, the males displaying a profuse mane or mantle of pale grey hair which is very distinctive. The buttocks are bight red and the front of the face pale pink. Like other baboons, it lives in large troops sometimes numbering several hundred, but is found only in drier areas at comparatively low altitudes where it generally roosts on rocky cliff ledges. 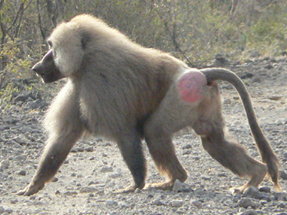 In some area of Ethiopia, such as the Awash Park, its range overlaps that of the common baboon, with which it is said sometimes to interbreed.